As published in the National Business Magazine May 2009 Issue. Inadequate advice regarding the Personal Property Securities Register could be putting many small businesses at risk. An Auckland debt collection specialist believes many small businesses will go broke in the current economic downturn through ignorance of their rights. And in most cases, says Wal Britton, of Accounts Enforcement, the blame for that rests with their professional advisers. According to Britton, the vast majority of small businesses are not taking advantage of the security provided by the seven-year-old Personal Property Securities Act (PPSA). "I think it's absolutely bizarre in this environment, that accountants, economic commentators and even the Government are not strongly advising small businesses to use the PPSA to protect their rights," he says. "It's and essential part of prudent business practice." Britton's concerns are shared by John Price, of insolvency specialists Horton Price, who reaffirms that the vast majority of small businesses are not utilising the protection of the Personal Property Securities Register (PPSR), which was established under the Act. He says his practice had recently completed the liquidation of a retailer in which "no more than 15 percent of suppliers" had a valid registration on the PPSR. "Not having registration meant those suppliers lost stock that they could otherwise recover and put back into inventory." In the current environment, Price warns, suppliers face a very real threat of multiple liquidations amongst their customers. "What's worse, if they do not have valid registration on the PPSR they risk a ‘double whammy'- not only do they lose the customer who had gone into liquidation but they also lose the stock which they had supplied and hadn't been paid for." In today's marketplace, Price advises, all small businesses should be ensuring they are registered to give themselves the best chance of at least getting something back when a client goes into liquidation. A centralised, electronic Personal Property Securities Register (PPSR). "This ensures the ownership of the goods doesn't pass to the purchaser until they have been paid for in full. In the event of the purchaser going into liquidation, registration means the seller is able to minimise their loss." Without registration however, such goods can be sold by the liquidator and the funds raised used to pay priority creditors. "Examples of companies who have been caught out in this way include a manufacturing jeweller with items on display in a company that went into liquidation, a company leasing EFTPOS machines and another firm which supplied coffee machines to restaurants and cafes," says Britton. "Probably the most famous case of all was the firm which hired portaloos to a construction company. When the construction company went broke the liquidator sold the portable toilets and gave the money to the bank. "The owner of the toilets sued the liquidator but, because the portaloos weren't registered on the PPSR the court ruled that the liquidator had the right to sell them – even though the company in liquidation didn't own them. "Our advice to all companies who offer credit to their customers is to have a PPSA policy in place. It's not a difficult process. The appropriate wording on your contractual documents provides protection on all goods and service supplied, which will then enable businesses to register a security. "However, you can't place a PPSR retrospectively if you hear that a firm that you've sold or leased goods to is in trouble. The registration must be completed prior to supply." Convinced that every accountant in New Zealand should have told their clients of the ramifications of not registering transactions on the PPSR, Britton also says a huge number of companies are exposed at the moment, but just don't realise it. "Especially in the current environment, it's crucial that all companies selling goods on credit have a PPSA Policy in place." As published in the The National Business Review on 9 April 2009. HTML edited and digitised with permission of the National Business Review. According to Mr Britton, the vast majority of small businesses are not taking advantage of the security provided by the seven-year-old Personal Property Securities Act (PPSA). Wal Britton's concerns are shared by John Price, of insolvency specialists Horton Price, who reaffirms that the vast majority of small businesses are not utilising the protection of the Personal Property Securities Register (PPSR) - which was established under the Act. In the current environment, Mr Price warns, suppliers face a very real threat of multiple liquidations amongst their customers. "What's worse, if they do not have valid registration on the PPSR they risk a 'double whammy'- not only do they lose the customer who had gone into liquidation but they also lose the stock which they had supplied and hadn't been paid for." In today's marketplace, Mr Price advises, all small businesses should be ensuring they are registered to give themselves the best chance of, at least getting something back when a client goes into liquidation. centralised, electronic Personal Property Securities Register (PPSR). "In simple terms, all companies who trade with a person or company, providing goods on credit – even leasehold or hired items – should register the transaction on the PPSR," Mr Britton explains. "This ensures the ownership of the goods doesn't pass to the buyer until they have been paid for in full. "In the event of the buyer going into liquidation, registration means the seller is able to minimise their loss." "However, you can't place a PPSR retrospectively if you hear that a firm that you've sold or leased goods to is in trouble. The registration must be completed before supply." 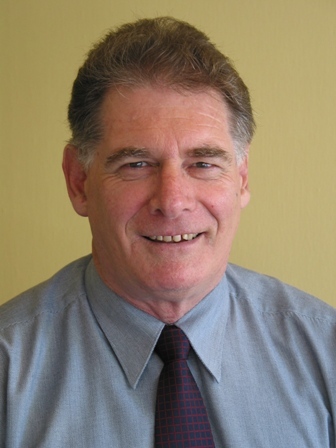 Convinced that every accountant in New Zealand should have told their clients of the ramifications of not registering transactions on the PPSR, Mr Britton said "A huge number of companies are exposed at the moment, but just don't realise it." As published in the The National Business Review on 23 Sept 2008. HTML edited and digitised with permission of the National Business Review. Debtors are gaming the long waits for proceedings in the High Court in Auckland with some businesses counting on delays of up to six months to stave off creditors seeking liquidations. Accounts Enforcement managing director Wal Britton says this means businesses are using their creditors – often small and medium sized enterprises – as personal banks. Creditors seeking payment after exhausting ordinary options to recover their bills could issue a demand notice which had to be paid within 15 days – but if that went unanswered, Mr Britton said, enforcing an insolvency through the courts could take up to another six months. Businesses may eventually cough up, but the use of that cash was lost during the wait, and could cause cash-strapped creditors to go to the wall. The government has taken steps to speed up the superior courts after criticism earlier this year, although these mainly affect the larger commercial and criminal cases, which are heard on a separate list. Most insolvency and liquidation applications, as well as summary judgments, are heard by the two associate judges at the High Court in Auckland. The recent Criminal Procedure Bill reformed rules for the High Court allowing its judges to send criminal trials around pure methamphetamine ("P") to the district courts. "P" trials tend to be long and evidence heavy, no matter the seriousness involved. This amendment was expected to unclog the High Courts to some extent, but did not address wider concerns in the legal community about the way the High Court managed its caseload. In February NBR reported on a New Zealand Bar Association conference about the future of litigation, where eminent lawyers argued the High Court had become bogged down. Chapman Tripp partner Jack Hodder and Jim Farmer QC said that the court system had failed business as the cost and time for civil cases in the High Court had blown out. A common theme was that court rules encouraged too much irrelevant material to be introduced into proceedings. As published in the Sunday Star-Times on 19 March 2006 in page D7. HTML edited and digitised with permission of the Sunday Star-Times. 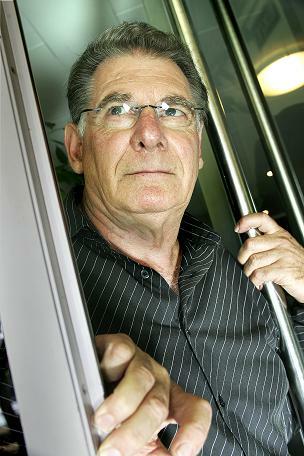 In any month, Wal Britton is chasing several million dollars of unpaid debts. He is one of an army of debt collectors working to extract money owed by recalcitrant debtors to their clients - often companies which have reached the end of their tether after providing goods and services and getting nothing but a string of broken promises in return. Debt collectors do not have a reputation for having a sense of humour, but they do need one, says Britton, a former newspaper photographer and now the boss of Accounts Enforcement Limited. If they do not, he says, they burn out quickly. They also need patience, because the strategies and excuses being used by debtors seeking to wriggle out of paying are few, and commonly used. But for each, the debt collectors have developed their own counter-measures. The torn cheque scam: The accounts department receives a letter of payment with the corner of a cheque attached. Often that letter will then pass through several sets of hands, and it will be assumed the cheque was sent, but accidentally torn off. Not a way of ducking the debt forever, but debtors can string this one out, buying themselves time. The sudden bereavement: There's nothing like news of a death in the family to soften the hard heart of a creditor. Do not bet on it, says Britton. Debt collectors are a cynical bunch, and are focused on one thing - getting paid. One woman Britton pursued for a debt had forgotten she had used this excuse once before. Britton recalls the moment. "I asked her, 'What again? I'm so sorry'." The blanket denial: "Is that Mr Smith?" "No. He's moved away." Proving that is not the case is a headache for debt collectors, but they can do it. If debtors do disappear, a trace agent may be set on their trail. Growing in popularity is the line: "No, he's moved to Australia." It is designed to throw debt collectors off the trail and discourage them, because it is uneconomic to chase small debts in Australia. The corporate veil: Property developers are noted for this, says Britton, and a lot of small companies get hurt. Setting up a company for a short time, then declaring it insolvent, can leave creditors high and dry. The instant dispute: Funny how a small proportion of clients suddenly becomes disgruntled with the goods or services received when it is time to pay for them, says Britton. When it is a case of a larger company owing a smaller company, there is a serious legal mismatch. Not getting paid can quickly drive a small firm to the wall, and that can mean a family's livelihood gone, and the family home at risk, so it is worth using all legal means to prevent that happening. But too few firms are taking simple precautions. These include not letting bad debt drag on. The older the debt, the harder it is to recover. Firms should also reserve the right to impose penalties for late payment. Goods which have not yet been paid for can be registered as security against that repayment with the Personal Property Securities Register at www.ppsr.govt.nz for $3, which should make court action easier. As published in the Motor Equipment News in April 2006 on page 3. COLLECTING MONEY FROM slow paying customers has become less hassle with new software developed by debt collection company, Accounts Enforcement Ltd (AEL), in Auckland. 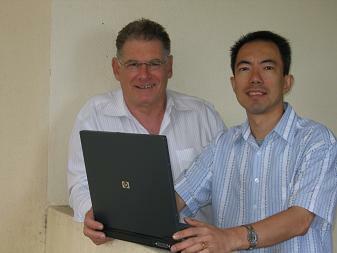 Wal Britton, (left) managing director of AEL and the company's software programme writer, Louie Wong. Wal Britton, managing director of AEL said that fundamentals of collecting from slow paying customers are "to promise what you say you will do and never forget the detail of any arrangements." "This software essentially makes sure these assurances are in place," he said. There was no uniform software package that suited such a wide variety of clients that the company serves, "so we have developed our own," said Wal Britton. In any week, AEL is communicating with hundreds of slow paying debtors for dozens of clients from many different industries. The DMS gives each client up to the minute details of every slow paying client, such as what was last promised and when payments can be expected. Wal Britton said most New Zealand companies do not budget adequately for bad debts, which can average between two and three percent. "Reducing this percentage improves net profit to a much greater percentage so management of debtors has real value," said Wal Britton. "Better cash flow management also reduces bank overdraft costs," he said. A data base for sales staff to quickly check a customer's credit risk before confiming new sales. Software includes web and VB front end for client interface through a secure password and SQL back end.